Persians Cats, with their long flowing coats and open pansy-like faces are the number one breed in popularity. Their sweet, gentle, personalities blend into most households once they feel secure in their new environment. ​​Creatures of habit, they are most at home in an atmosphere of security and serenity, but with love and reassurance, can easily adapt to the most boisterous of households. Their quiet, melodious voices are pleasant and non-abrasive. They communicate delightfully with their large expressive eyes and make charming pets for all ages. ​​ Persians have short heavily-boned legs to support their broad, short bodies. They like to have their feet firmly planted and are not given to high jumping and climbing. Playful but never demanding, they love to pose and will drape themselves in a favorite window or chair, enhancing the decor in much the same way as a treasured painting. ​​ Persians are tremendously responsive and become a constant source of joy and delight to their owners. Pleasurable as an unexpected sunbeam, their companionship is close and enduring. Their long flowing coats require an indoor, protected environment. Proper maintenance requires a daily run-through with a metal comb to eliminate the potential drawbacks of tangles and hairballs. An occasional bath, attempted only after a complete comb-through and clipping of the nail tips, will keep the coat clean, healthy and beautiful. It is wise to establish the routine of the bath when they are young. ​​ Keeping the Persian indoors also keeps it safe from transmission of disease and parasites, as well as the dangers of urban life. With an annual trip to a trusted veterinarian, and good nutrition and care, the Persian can live as a family member for easily 15 years, and some surpassing 20 years. Persian breeders dedicate themselves to breeding healthy cats, availing themselves of the latest in veterinary screening procedures to test for any heritable disease conditions. A well-bred Persian is a hardy and healthy cat and is not more prone to illness and respiratory infections than other breeds. ​​ However, the large eyes do mean that a certain amount of tearing is normal, and a daily face wash is recommended. 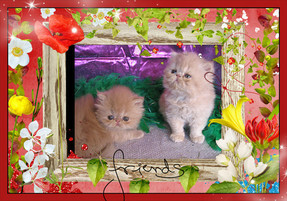 Pricing on Persians usually depends on type, applicable markings and bloodlines distinguished by Grand Champion (GC), National, National Breed and/or Regional winning parentage (NW, BW, RW) or of Distinguished Merit parentage (DM). The DM title is achieved by the dam (mother) having produced five CFA grand champion/premier (alter) or DM offspring, or sire (father) having produced fifteen CFA grand champion/premier or DM offspring. I am interested in a kitten. What do I do? The first step is to fill out my Contact us form. This helps us get to know you a little better and what you are looking for. We will then be able to discuss options and what we may have available for adoption at that time or what our breeding plans are for the future. We try to find the best match possible to ensure that you and your kitten begin your new life together on the right foot. We reserve the right to refuse the placement of a kitten if we feel it is the best interest of the kitten to do so. We will then require a non-refundable deposit. Deposits are not refunded for any reason so please be sure you are ready to commit when you place your deposit. The reason for this is the kitten loses opportunities for placement as then the kitten is on hold specifically for you. When can my kitten come home? We do not allow our kittens to leave before 10 weeks and we prefer to wait until the kitten reaches 10 - 12 weeks of age. At this point kittens are well socialized, properly litter trained and most of all healthier. Their immune systems are stronger and this makes a big difference in ensuring that they remain strong and healthy. Sometimes people think they will miss out on the cuteness and cuddliest period of their kittens life. This is simply not true. 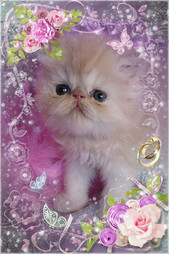 Persians are notorious for their people oriented personalities and are a slow maturing breed. You will still have a cute little bundle of joy but they will be healthier and generally more well adjusted. I see that you offer retired adults too. Why? We strive to retire our adults at a fairly young age so that can live out the rest of their lives as someone's pampered and beloved pet. We love them very much and wish we could keep all of them but in order to keep our program small, we feel it is important that they go to a loving fur-ever home.